I have both the horizontal and vertical lines about half way done; this picture shows the corner where they are both done.I am pretty sure I will also be quilting straight lines just inside the edges of the 9-patch squares too. It will take a few more days of work to finish the straight line quilting and then I still need to decide how to quilt the borders. So, I have a color scheme in mind and hope I can find enough different fabrics in the colors I want. Have you made a Jane Stickle quilt? Started one? Do you want to? How crazy do you think I am? There are some blocks that are just "all-time favorites", and the Dresden Plate is one of mine. Nice job on this. 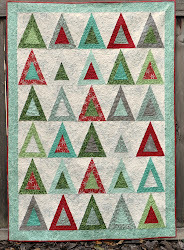 The straight-line quilting is adding a nice graphic look to your quilt. 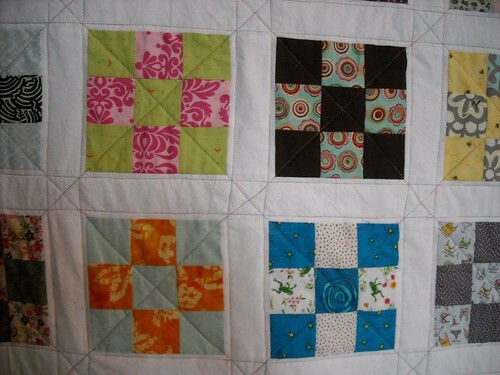 And the Jane quilt? Admire the daylights out of those who make them, but have no motivation to make one myself! 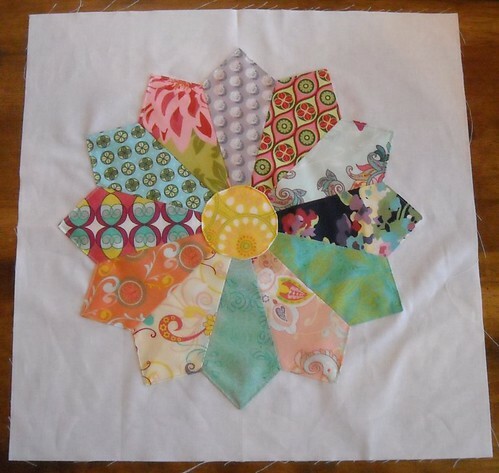 Very pretty quilt block and love the quilting so far!